If one primarily thinks of Gustav Stickley as a furniture-maker, these are odd words. To be certain, his initial quest was to create a distinctively American line of furniture. His rapid success in this endeavor soon lead to developing related lines – “metal work followed as a matter of course because it was the next thing needed; then the dressing of leathers to harmonize with the style of the furniture and wood of which it is made. Then came the finding of suitable fabrics and the kind of decoration most in keeping with them, and from all these parts was naturally developed the idea of the Craftsman house as a whole.” [ii] If we explore the concept of the Craftsman interior we see why textiles were such a priority for Stickley in creating a restful, friendly, comfortable home. Gustav Stickley offered textiles not merely as an additional product line, nor as simply utilitarian objects but as an integral element in his vision of providing Americans with a distinctive, yet comfortable and cheerful home. In doing so he methodically developed what would become a unique style of American Arts & Crafts textile. The chapter in his 1909 Craftsman Homes describes the basics and its title illustrates the significance placed on textiles -- “The Kind of Fabrics and Needlework that Harmonize with and Complete the Craftsman Decorative Scheme”. At first it was very difficult to find just the right kind of fabric to harmonize with the Craftsman furniture and metal work. It was not so much a question of color, although of course a great deal of the effect depended upon perfect color harmony, as it was a question of the texture and character of the fabric. Silks, plushes and tapestries, in fact delicate and perishable fabrics of all kinds, were utterly out of keeping with Craftsman furniture. What we needed were fabrics that possessed sturdiness and durability; that were made of materials that possesses a certain rugged and straightforward character of fiber, weave and texture,—such a character as would bring them into the same class as the sturdy oak and wrought iron and copper of the other furnishings.
. . . These are mostly woven of flax left in the natural color or given some one of the nature hues… . and for window curtains we use nets and crepes of the same general character. A material that we use more than almost any other for portieres, pillows, chair cushions,—indeed in all places where stout wearing quality and a certain pleasant unobtrusiveness are required—is a canvas woven of loosely twisted threads of jute and flax and dyed in the piece,—a method which gives an unevenness in color that amounts almost to a two-toned effect because of the way in which the different threads take the dye. This unevenness is increased by the roughness of the texture, which is not unlike that of firmly woven burlap. ... Our usual method of decorating this canvas is the application of some bold and simple design in which the solid parts are of linen appliqué in some contrasting shade and the connecting lines are done in heavy outline stitch or couching with linen floss. 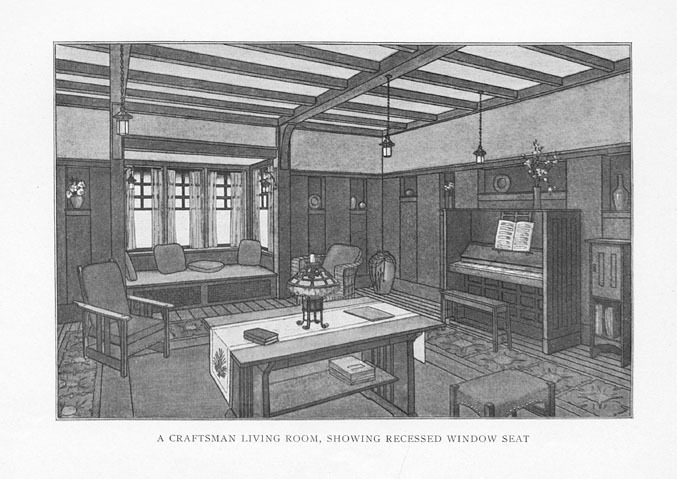 Particularly through the publication of The Craftsman magazine, Stickley continued to promote the Arts & Crafts movement to a wider audience with instructional articles for various mediums of craftwork, even for many of the same items which were offered for sale completed by Craftsman Workshops. While many others adopted similar textiles for interior use in Arts & Crafts style homes at the time, it is the nature of the designs and the methods of appliqué and embroidery stitches which distinguish Gustav Stickley’s textiles. Likewise, many of the basic uses of textiles in the home were common at the time but Stickley was instrumental in defining appropriate textiles for Arts & Crafts interiors and developing distinctive features for those common uses—table linens, curtains, portieres, wall hangings, bedspreads and pillows. Ill.1 The visual metaphor of a landscape can easily be imagined from this living room interior published in October 1905. The sheer curtains are a corn yellow, the pillows green and the scarf on the library table the pinecone motif. [iii] Craftsman Fabrics and Needlework, pp. 1-2. [iv] Craftsman Fabrics and Needlework, p. 5. This is an expanded version of the article Mr. Stickley's Textiles in the Craftsman Interior originally published in Mr. Stickley's Needle-Work, for an exhibition catalog produced by the Sitckley Museum at Craftman Farms, held at the 23rd Annual Arts and Crafts Conference, Grove Park Inn, Asheville, North Carolina, February 2010.